The Sinn Féin leader said a “crash” no-deal Brexit moves the timeline for a border poll on a united Ireland forward. RAISING THE ISSUE of a border poll now is “disruptive and destructive” to getting a Brexit deal ratified, according to Taoiseach Leo Varadkar. 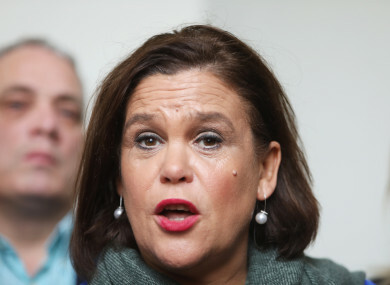 Sinn Féin leader Mary Lou McDonald has said a “crash” no-deal Brexit moves the timeline for a border poll on a united Ireland forward. She told reporters this morning that in the case of crash-out deal, a border poll should be called. Speaking at Leinster House today, McDonald said she wants to hear to what extent the government is making preparations for a “Constitutional transition” and a referendum on Irish unity. “Let’s be very clear, if there is a crash, the damage arising from that will not be fleeting, it will be long-term,” she said. Describing yesterday in Westminster as a “shambles”, McDonald said she has told the UK Prime Minister Theresa May many times that “in the event of a crash, that certainly the issue of a referendum on unity would move, advance, very, very quickly”. She said the UK “couldn’t expect Ireland to endure so much damage and simply be prepared to soak that up”. Repeating her calls for a border poll during Leaders’ Questions, McDonald said uniting Ireland would remove the issue of the backstop. Varadkar told the Dáil that if he didn’t know McDonald better, one would think her party wanted a no deal Brexit in order to “stir up” trouble in the North. He said the government’s focus at the moment is the ratifying the deal, adding that raising the issue of a united Ireland now is “disruptive”. McDonald said she also wants to be told about the State’s level of preparedness for such a referendum, as well as contingency plans in place. Tánaiste Simon Coveney said earlier today that he was bringing a paper to Cabinet on the preparedness for a crash Brexit. While McDonald said she did not want such no-deal scenario to become a reality, she believed such an incident could happen by “accident”. Fianna Fáil’s Micheál Martin also called on Varadkar to publish the Irish government’s contingency plans known as the “central case scenario plan”, however, the Taoiseach explained that there is no single overarching document. Varadkar said recruitment of staff and infrastructure at ports and airports will be made public as will any legislation that is needed. He added that the EU Commission has been consulted in relation to the level of State aid Irish businesses might need. Addressing the issue of the contentious backstop in the withdrawal agreement, the Taoiseach told the Dáil the backstop is “not just an Irish issue”, stating it is important to Europe too as it is necessary as an “open Irish border could otherwise cause the single European market to be contaminated”. McDonald is due to speak with May on the telephone later this evening. She will reiterate her view that a withdrawal agreement is only possible with the minimum protections left intact, said McDonald. If May is proposing on diluting the agreement, “then she is very, very misguided,” said McDonald. Email “Taoiseach tells Mary Lou that talking about a border poll now is 'disruptive and destructive'”. Feedback on “Taoiseach tells Mary Lou that talking about a border poll now is 'disruptive and destructive'”.